If the hot water in your shower doesn’t seem to reach the temperature it once did or last as long, it may not be your imagination – it might be time to replace your hot water heater elements. Most traditional electric water heaters have two elements that heat the water in the tank and depending on which begins to fail, your water will either not get as hot as it should or you’ll run out of heated water very quickly when filling a bath or taking a shower. Fortunately, changing the elements is a fairly easy DIY job and in no time at all you can be washing the project’s grime away under a stream of hot water. Turn off the power – there should be a breaker in your electrical panel marked “water heater.” Turn this breaker to the off position and make sure family members know it is to remain that way until the project is complete. Turn off the water – there should be a valve on the cold water supply line going into the water heater – turn it off. Drain the heater – there’s a drain valve near the bottom of the hot water heater tank that allows you to hook up a common garden hose. Connect a hose and depending on where your tank is located, put the other end out a window or door or down a floor drain — into a tub will also work. Open the drain valve at the tank and check that water is exiting through the hose. Remove the element covers – there should be two small panels held on by screws on the exterior of the water heater tank – these allow access to the elements and the wiring to the elements. Remove the panels and sit them and the screws aside. Electrical testing – even though there should not be any power to the elements with the breaker turned off, it’s still a good idea to use an electrical tester at the wire terminals on the ends of the elements just to be sure. An inexpensive tester that lights up if electricity is present is all that you need. Purchase new elements – examine the exposed ends of the elements to see how they are secured to the tank. 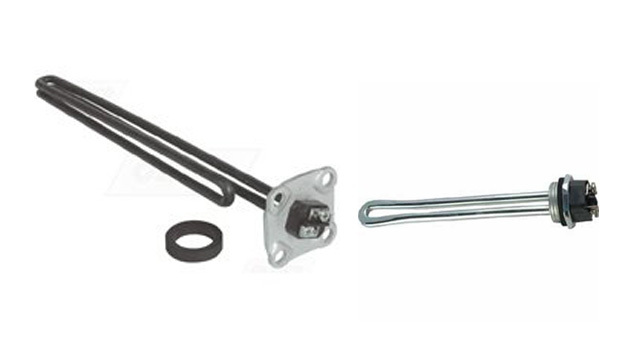 Most heaters have elements that are either held on with bolts (these are called flange elements) or the entire element screws in. Purchase new elements that attach in the same fashion from your local hardware, home improvement, or plumbing supply store. They should match the voltage of the old elements and be the same or less wattage. Release the tank pressure – when you get back from getting the elements, check to see how the tank drainage is proceeding. If you have a 40 gallon or larger heater, it can take a while. Tapping on the side of the tank can give you a good idea of how much water is left – when it gets pretty low, open the pressure release lever at the top of the tank to speed things along. Replace the elements – when water finally stops coming out of the end of the hose, close the drainage valve and remove the hose. You can also close the pressure release valve at this point. Disconnect the wiring from the end of the old elements and remove them from the tank – once loose they should pull straight out, but you may have to tap gently to free them up. Install the new elements taking care to seat the new gaskets that should have come with them properly. Reconnect the wiring in the same fashion as it was on the old elements. Leave the access panels off for now. Refill the tank – check to ensure the drain valve is closed and then open the water supply valve at the top of the tank. As the tank fills, check for leaks at the new elements. If you have any leaks, turn off the water and drain enough to remove the element and reseat the gasket. When you’re sure there isn’t any water escaping, put the access panels back in place. Turn the power on – when you’re sure the tank is full, turn the breaker back on to heat the water. DO NOT do this unless the tank is full as your new elements may burn up if they aren’t covered with water. Congratulations, you have replaced the elements in your water heater and depending on the size of your tank; there should be hot water at the faucets in 30 to 45 minutes.